These teddy bears will taste as good as they look, thanks to generous amounts of chocolate. They’d be great for a holiday party, baby shower or any time! What You Need: 1 cupcake; chocolate frosting; 3 black M&Ms (or other candy); black writing icing; pastry bag and round metal tip #5 (or snip corner off of a plastic sandwich bag). 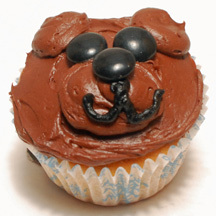 How to Make It: Squeeze bag with chocolate frosting to make a large dollop for bear nose and two smaller dollops for ears. Use black writing icing to “draw” mouth. Add M&Ms for eyes and nose. These cupcakes are based on an idea in the latest Betty Crocker Supermoist cake periodical. They’re perfect for kids to make, with decorations you probably already have in your kitchen. How to Make It: Frost cupcake. 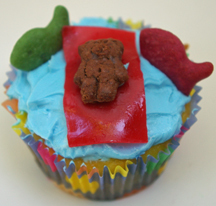 Cut strip of fruit roll for bear’s raft and place on cupcake. Use dab of icing to stick bear onto raft. Add a couple of fish in the water. These cupcakes are inspired by the latest Betty Crocker Supermoist publication. You can make the sand out of crushed-up graham crackers or just use brown sugar. How to Make It: Frost cupcake. 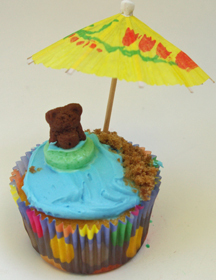 sprinkle graham cracker crumbs or brown sugar at one edge for “sand.” Cut legs off bear (ouch!) and use a dab of frosting to stick into Lifesaver. Add paper umbrella.